WOODBRIDGE, VA -- An Army staff sergeant assigned to the Pentagon is jailed Sunday on murder and other charges in the death of a police officer and another person. Ronald Hamilton, 32, is being held without bond in the Prince William County Adult Detention Center on charges that include murder of a law enforcement officer. 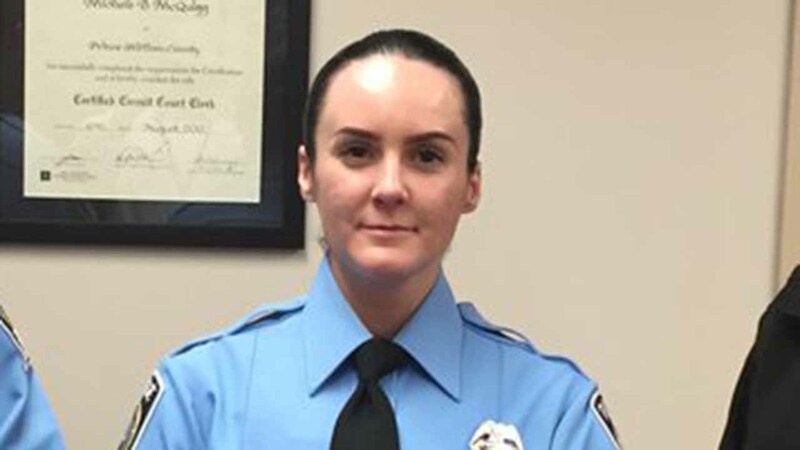 Officer Ashley Guindon was shot and killed after answering a domestic violence call at Hamilton's home Saturday evening. Two other officers were hospitalized with injuries. The suspect is an active duty Army staff sergeant assigned to the Joint Staff Support Center at the Pentagon, Cindy Your, an Army spokeswoman based at Fort Meade, Maryland, said in an email. Prince William County Commonwealth's Attorney Paul Ebert told The Associated Press on Sunday morning that the gunman's wife was the victim in the domestic incident. He did not provide her name. The Pentagon, contacted via email, did not immediately confirm details about Hamilton's employment there or his arrest. The shooting occurred Saturday evening at Hamilton's home in Woodbridge, where neighbors say he lived with his wife and their 10-year-old son. Officers received a call around 5:30 p.m. Woodbridge, about 30 miles southwest of the nation's capital, about a "verbal argument," Perok said. It's not clear how the altercation between the suspect and police began but the suspect, whom he identified as a military serviceman, was not injured, he said. Guindon had been a county police officer a few years ago and had left and returned to the force, Corey Stewart, chairman of the Prince William County Board of Supervisors, said in a phone interview with The Associated Press on Saturday night. He did not know the exact dates of when she started and left, he said. Stewart also said there was a child in the house during the incident who was not harmed.